At one point last season, Giancarlo Stanton went 61-for-176 (.347) with 30 home runs — 30 home runs! — in a span of 48 games. And at one point two years ago, Stanton went 11-for-88 (.125) with 44 strikeouts in a span of 24 games. Within that 24-game slump was a brutal 0-for-17 with 15 strikeouts stretch. For real. Even with a strikeout rate hovering around 30%, Stanton was still extremely productive from 2010-16. The guy hit .266/.357/.539 (142 wRC+) and averaged 41 homers per 162 games those years. He struck out often and made pitchers pay often. Then last year, Giancarlo cut down on his strikeouts, and he became the NL MVP. 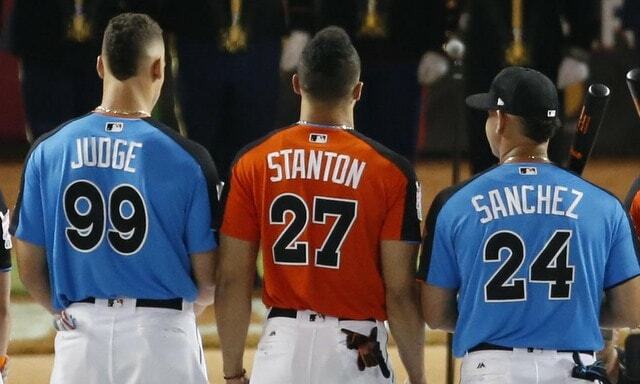 Stanton is a Yankee now — did you get the memo? — and in Aaron Judge, the Yankees have the closest thing to Stanton as well. It’s pretty cool. Judge was actually better than Stanton last season. Giancarlo hit more homers, but Judge had the edge in AVG, OBP, wRC+, and both versions of WAR. Drew more walks and stole more bases too. Of course, Judge also struck out more than Stanton. Forty-five more times, to be exact. Judge struck out more times than any batter last season. 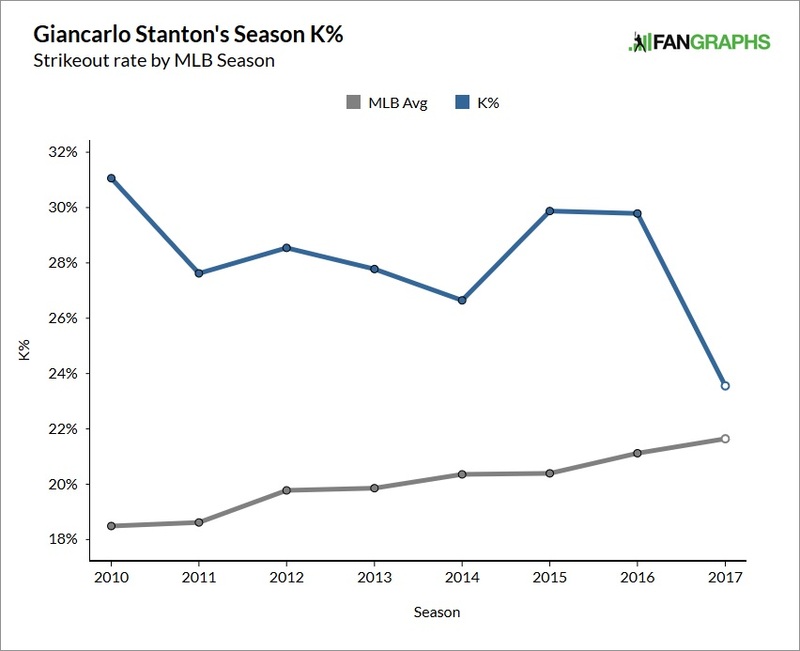 Stanton has never led his league in strikeouts, but he’s consistently had one of the highest strikeout rates in the baseball throughout his career. At least until last season. Stanton cut down on his strikeouts last season and, given the similarities in their games and their size, it’s only natural to wonder whether Judge can do the same. Specifically, could the adjustment Stanton made also work for Judge? It might! It also might foul Judge up and turn him into a taller Ronald Torreyes at the plate. Who knows? Stanton really closed up his batting stance. I mean really, really closed it up. Now for the twist ending: That screen grab on the left is from June 19th of last season. The screen grab on the right is from September. 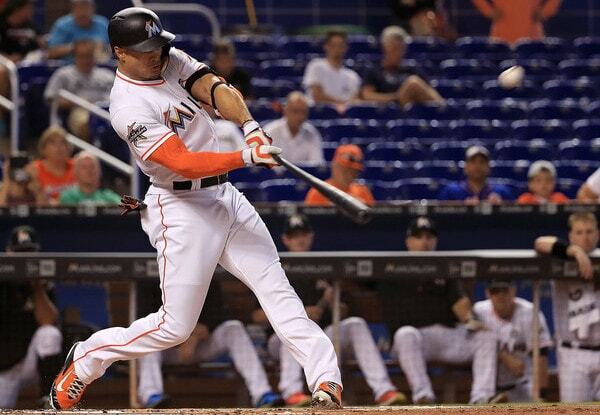 Stanton made that adjustment and closed up his batting stance in the middle of the season. He didn’t do it over the winter. Neat! Once Stanton started to close his stance, he swung and missed less, which meant more balls in play, and given his power, that meant more dingers. It’s probably not a coincidence Giancarlo went on that monster home run tear — again, he hit 30 homers in 48 games at one point last season — in the second half, after closing up his stance. Here are two heat maps. 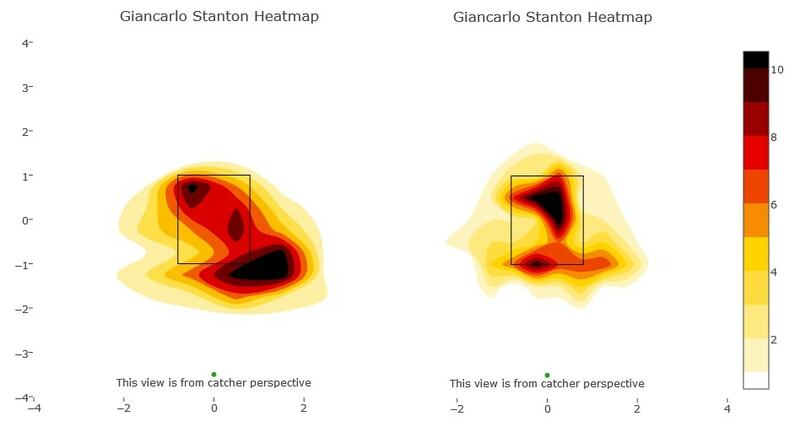 The heat map on the left shows Stanton’s swing-and-misses in the first half last season, and the heat map on the right shows Stanton’s swing-and-misses in the second half last season. So basically open stance vs. closed stance. Stanton had problems with pitches down and away — like most hitters — specifically breaking balls. Those sliders look like fastballs down the middle until they start sliding. Once he closed up his stance though, Stanton was able to get to that down and away pitch more effectively, hence the reduction in swings and misses and strikeouts. Over the years Judge has gone through several batting stance changes designed to help him make more contact, and hey, they’ve worked like a charm. Dude became the first rookie in history to hit 50 homers last season and he was the MVP runner-up. Who cares how much he strikes out when he produces like that? Would we all feel better if we replaced 70 strikeouts with 70 ground outs? Yup. What Judge did last season was unprecedented given his strikeout rate. Maybe he is a unique case and can continue producing at that rate while striking out so much. He’s done it once, right? Maybe he can do it again and again and again. That said, the smart money is on Judge having to cut down on his strikeout rate to maintain that offensive performance. Fewer strikeouts equals more balls and play, and when you hit the ball as hard as Judge, that means a lot more damage. And who knows, maybe Judge can take his offense to another level if he cuts down his strikeout rate. That’d be pretty awesome. 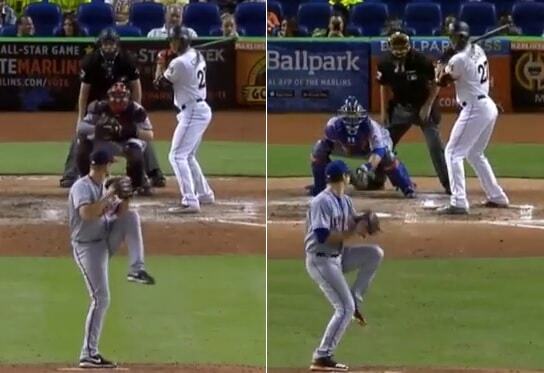 Stanton’s batting stance was more closed than that before he closed it up even more last year. 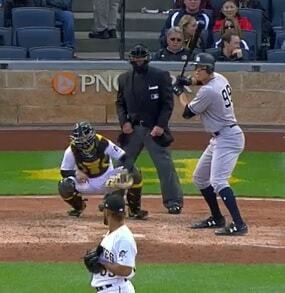 Would it make sense for Judge to close up his stance to combat that down and away pitch? And if it does, would it hinder his ability to handle the inside pitch? Judge is pretty great at turning on inside pitches for a dude his size. You’d hate to take that away. Given how great he was last season, and how successful he’s been at making adjustments throughout his career, it’s tempting to say Judge shouldn’t screw around with anything. You don’t want to risk breaking something that doesn’t need to be fixed, you know? Judge is a smart hitter. Let him adjust naturally and hope he cuts down on strikeouts that way. What worked for Stanton might not work for Judge despite their similarities. 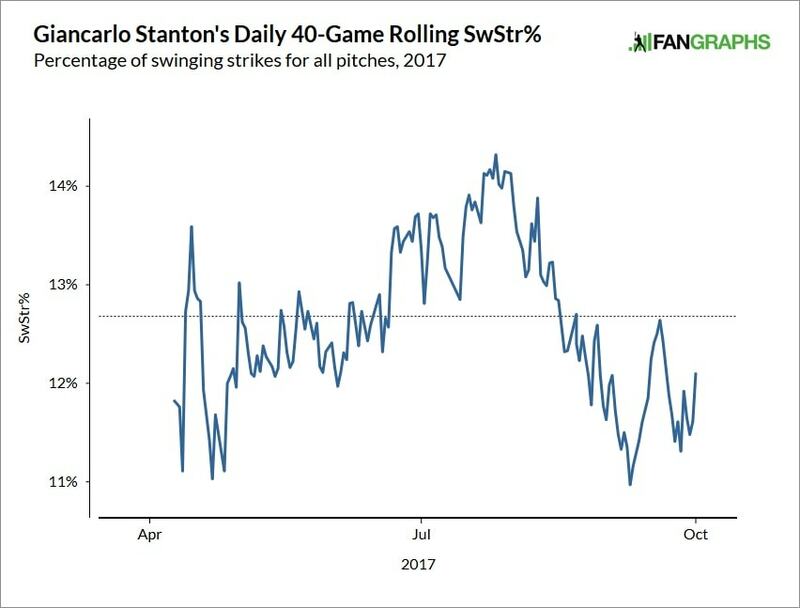 At the same time, Stanton had such great success after cutting down on strikeouts last season. It’s not only him either. George Springer is another guy who’s cut down on his strikeouts over the years and had increased success. Judge is great already, but with a few more balls in play, he could be even better, as crazy as that may sound. Stanton closed up his stance to close off that hole against down and away pitches. Something similar could work for Judge as well. What a difference a year makes. Last year at this time the Yankees were talking about a transition year and dealing with growing pains as they incorporated several young players into the everyday lineup. Now the Yankees are a World Series contender. Those young players thrived last season and helped the Yankees get to Game Seven of the ALCS. Being the underdog was fun. Time for the Yankees to get back to dominating the sport. The goal this offseason and every offseason is to improve the organization, both short and long-term. Rebuilding teams focus more on the long-term. Contenders like the Yankees do a little of both, though they may sacrifice the long-term for the short-term on occasion, and that’s okay. Success can be fleeting in this game and I applaud any team that does all they can to win now rather than focusing on a future that may never come. With Spring Training a week away, the Yankees have made one big addition (Giancarlo Stanton) and three smaller subtractions (Starlin Castro, Chase Headley, Todd Frazier) this winter. That’s pretty much it, right? Minor league signings like Danny Espinosa and Jace Peterson happen every year. Talented but erratic arms like Bryan Mitchell are dealt away every winter. Those are standard baseball moves. The Stanton, Castro, and Headley deals aren’t. So, when camp opens next week, the 2018 Yankees are going to look fairly similar to the 2017 Yankees. I thought last year’s club was good enough to win the World Series. They just didn’t. Why, then, are the Yankees supposed to be better this coming season? I’ll give you five reasons. Starting here because this is the obvious upgrade. 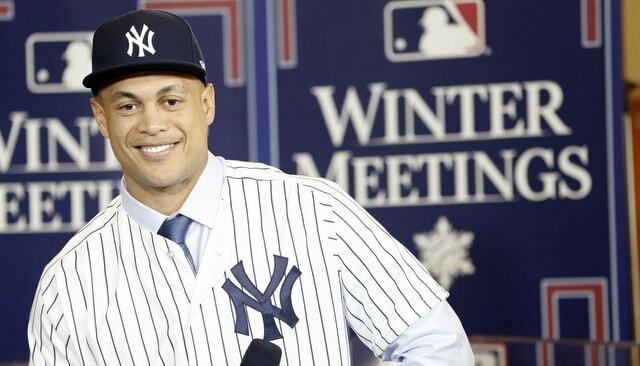 The Yankees added the reigning NL MVP this offseason! And he also happens to be the game’s top power hitter, and he turned only 28 in November. Pretty awesome. It cost them Castro and some prospects, but who cares? Stanton is too good. ZiPS projecting 55 homers and a .656 SLG for Stanton blows my mind. I’ve been looking at ZiPS for more than a decade now and I don’t ever remember seeing the system spit out numbers like that. Anyway, yeah, the Yankees are improved because they have Stanton now, not Holliday, who by all accounts is a good dude. He just stopped hitting in mid-June. When it became clear the Yankees were contenders and not pretenders last season, Brian Cashman acted decisively and upgraded his roster at the trade deadline. He dipped into the farm system and traded superfluous prospects for Frazier, Sonny Gray, David Robertson, Tommy Kahnle, and Jaime Garcia. Frazier and Garcia were rentals and won’t be back this year. Or at least I don’t think Jaime will be back. You never know. Anyway, the Yankees acquired multiple years of Gray, Robertson, and Kahnle. They weren’t rentals. Robertson is signed through 2018, Gray is under team control through 2019, and Kahnle is under team control through 2020. All will be back this season and they are all reasons the 2018 Yankees will be better than the 2017 Yankees. Gray effectively replaces Michael Pineda in the rotation. Robertson and Kahnle are replacing Tyler Clippard and, uh, I guess Jonathan Holder? Whoever it is, the Yankees are better off. Greg Bird did not come over at the trade deadline, but he was not available to the Yankees most of last season because of his ankle injury. The injury limited him to only 48 games and 170 plate appearances. Didn’t even play a third of the season. The Yankees gave way too many first base plate appearances to guys like Chris Carter and Garrett Cooper last year. Last season the Yankees ranked 25th among the 30 teams in first base OPS+ and 22nd in first base WAR. Bottom third of the league production at the position. We still have no idea what Bird can do across a full season. 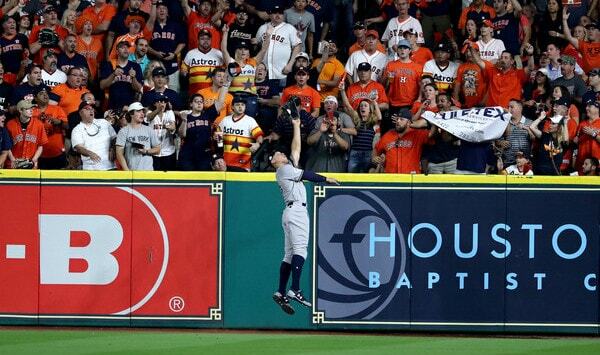 We’ve seen flashes of excellence, and gosh, his extreme fly ball tendencies make him a great mix for Yankee Stadium. A healthy Bird could be a considerable upgrade for the 2018 Yankees. Unfortunately healthy remains a big “if” with him, but fingers crossed. Chad Green started last season in High Class-A. True story. He didn’t join the big league team until May 8th, the day after the 18-inning game at Wrigley Field, and it wasn’t until late-July that he started pitching in high-leverage situations consistently. The cat is out of the bag now. Green is excellent, everyone knows it, and he will be used in important situations right from the get-go this season. The Yankees started last season with Dellin Betances and Clippard as their bridge to Aroldis Chapman. Now that bridge is Robertson and Green, with Kahnle around as the third wheel. The bullpen is in much better shape right now than it was a year ago. It’s always fun when a young pitcher like Green comes up, dominates, and begins assuming high-leverage innings. It’s much more fun when you already know that young pitcher can dominate and you don’t have to wait to see him in important situations. Come Opening Day, chances are Gardner will be the only player in the starting lineup over 30. The Yankees have an increasingly young roster, and talented young players have a tendency to get better. A lot better, in some cases. For some young Yankees, there is obvious room for improvement. Jordan Montgomery can cut down on the walks and be more efficient. Gary Sanchez can improve blocking balls in the dirt. In other cases, it can be difficult to see how improvement is possible. Example: How in the world is Aaron Judge supposed to get better? With him, it’s a matter of gaining consistency to avoid another big midseason slump, and maybe cut down on the strikeouts as well. It’s possible Judge will be very good and a more complete all-around player this season while putting up inferior numbers to last season. In his case, improvement may be more subtle. With other young players, it probably won’t be. There are plenty of other reasons the 2018 Yankees can be better than the 2017 Yankees. Masahiro Tanaka could stop giving up dingers. Betances could stop walking people. Gleyber Torres and Miguel Andujar could outproduce Castro, Headley, and Frazier. I’d bet against that last one, but it is possible. The Yankees are young and talented, and they have more young talent on the way. That’s exciting. More than anything, the Yankees figure to be better this year because they added Stanton, and because they’ll have full seasons of Gray, Robertson, Kahnle, Green, and (hopefully) Bird. Losing Frazier, Headley, and Castro is not insignificant. Those dudes combined for +5 WAR in pinstripes last year. Asking Gleyber and Andujar to do that is putting a lot on the rookies. Stanton is the single biggest reason to expect the Yankees to improve this year. There are a lot of smaller things that could add up to large improvement too. I don’t know about you, but as soon as the Yankees acquired Giancarlo Stanton, I started thinking about the lineup possibilities. Heck, I started thinking about them even before the trade went down, during the rumor phase. I reckon most baseball fans — even non-Yankees fans — were thinking about the lineup with Stanton after the trade. How could you not? It’s part of the fun of being a fan. Spring Training is not going to tell us anything about how Boone may arrange his regular batting order. Grapefruit League lineups are designed to let guys get their work in, then go home. That’s why veterans are always stacked high in the order. They get their two or three at-bats, then check out for the day. Spring lineups aren’t indicative of what we might see during the regular season. There is a case to be made for batting Aaron Judge leadoff given his on-base ability, though as I explained in a recent mailbag, I don’t love that idea because it wastes some of his power. Batting Judge leadoff means roughly one-fifth of his at-bats will automatically come with the bases empty. Teams are batting power hitters leadoff these days — Charlie Blackmon, George Springer, and Brian Dozier are regular leadoff hitters — but a 50-homer guy? Nah. You could also make a case for batting Aaron Hicks leadoff, or even Jacoby Ellsbury. I’m a Hicks believer, though I want to see him do it again before locking him into a premium lineup spot. Ellsbury? He’s not even a starter right now. Last season was his best offensive season in several years, and I think he has to earn that leadoff spot back, not be awarded it (and a starting spot) based on … his contract? Not sure what else it could be. For better or worse, Gardner is the obvious choice at the leadoff spot right now. He’s one of the best count-workers in baseball, he gets on base plenty, and he has enough pop to sock a few quick strike leadoff homers throughout the season. (Gardner hit five leadoff homers last year.) Gardner is a natural fit at the leadoff spot until his performance says he should should hit lower in order, and he hasn’t reached that point yet. Realistically, I’m not sure there’s anyone the Yankees could acquire for second and/or third base who should hit higher than eighth in the lineup. If they bring in Neil Walker and Eduardo Nunez, they’ll hit eighth and ninth. If they go with Gleyber Torres and Miguel Andujar, they’ll hit eighth and ninth. Maybe Mike Moustakas would bat sixth or seventh? I suppose, though I’m not counting on the Yankees signing him, not with the luxury tax plan. The middle of the order, the two through seven spots, have generated the most discussion this offseason because the Yankees have so many good hitters. How do you line them up? As long as Boone doesn’t do something silly like bat Judge or Stanton seventh, whatever he does will be fine. He’ll have really good hitters in the middle of the lineup no matter what. Let’s still talk about the lineup a bit. 1. How important is it to split up the righties? The lineup topic of the offseason. Stanton and Judge are two right-handed power hitters who will strike out, and because of that, I’ve seen an awful lot of people say the Yankees should squeeze a left-handed hitter between them in the lineup. We should include Gary Sanchez in this conversation too, because he’s another right-handed power hitter who will strike out from time to time. Don’t think it’s fair to use Bird’s overall season numbers given his injury and how crummy he was in April? Okay, he hit .222/.306/.508 (110 wRC+) against righties after coming off the disabled list and .270/.341/.574 (147 wRC+) during his big league debut in 2015, which feels like a lifetime ago. Point is, the three right-handed hitters all out-hit the two lefties against right-handed pitchers last season. Will they continue to out-hit them against righties this season? I don’t see why not. Judge, Stanton, and Sanchez are all in their primes — you could argue Judge and Sanchez haven’t reached their primes yet — and they’re all really good hitters. We’re not talking about some randos who BABIPed their way to a good year against righties in 2017. The numbers say it’s not worth squeezing a lefty between Judge and Stanton (and Sanchez) because they hit righties just fine. Empirical evidence says managers do weird stuff all the time and, inevitably, some manager will burn through his bullpen to play matchups against the right-left-right portion of the lineup, and it’ll come back to bite him. A manager will bring in his lefty specialist to face the lefty and leave him in against Stanton or Judge or Sanchez. It’ll happen at some point. You watch. Can you build your lineup around that though? Can you base your lineup on the idea that the opposing manager will make a silly pitching decision at some point? Teams are pretty smart these days. We’re seeing more true high-leverage relievers nowadays. 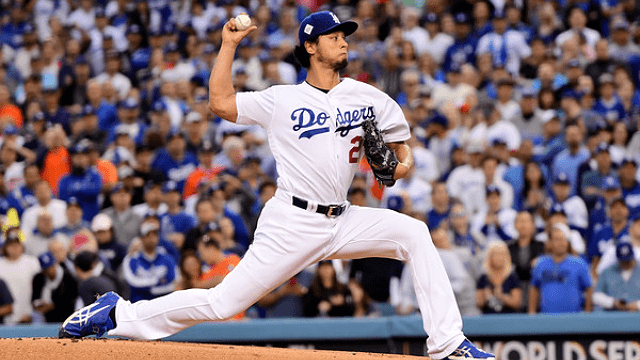 Managers bring in their best reliever in the game’s biggest spot regardless of platoon matchups. Left-on-left specialists like Clay Rapada are a dying breed. There isn’t enough room for a guy like that in the bullpen with starters throwing so few innings these days. I know what I’d pick. Judge and Stanton (and Sanchez!) are great hitters. Not good hitters. Great hitters. Squeezing a lefty between them for a sake of platoon matchups strikes me as paralysis by analysis. 2. What about splitting up the lefties? Paul O’Neill complains about this all the time during YES Network broadcasts. If you’re a righty who can’t hit righties, no one thinks too much about it. But if you’re a lefty who can’t hit lefties, it’s a Really Big Deal. You get labeled a platoon player and opposing managers have (or had for a long time) a designated guy in the bullpen to get you out. Righty specialists were never as much of a thing as lefty specialists. Not even close. Two things about this. One, I think splitting up Didi and Bird to potentially avoid unfavorable platoon matchups is more important than splitting up Judge and Stanton (and Sanchez!). And two, I don’t think splitting up Didi and Bird should be a top priority. Based on my observations, Gregorius can hang in well enough against southpaws, and will hit for an okay-ish average. Bird has a good eye will annihilate mistake pitches even against great lefties.
? Because that obsession with left-on-left matchups exists in baseball, at least moreso than right-on-right matchups, it might be worthwhile to squeeze a righty between Gregorius and Bird. Can that be accomplishment without weakening the lineup overall, and giving fewer at-bats to the cornerstone righties? I’m not sure. I won’t sweat it much. Designing a lineup around a scenario that might not happen never made much sense to me. It always bugged me that Joe Girardi would split the lefties to void the late left-on-left matchup rather than use a lineup that creates the best possible matchup against the opposing starter. It is what it is. Interesting! Interesting because it wouldn’t be completely insane if that were the Opening Day lineup. I could see it. Stanton batted second a bunch for the Marlins last season and Hicks would serve as the “second” leadoff guy in the nine-spot. That lineup projects to score 5.482 runs per game, or 888 runs per 162 games, according to the lineup analysis tool. I can’t shake the feeling the Yankees will sneak a left-handed contact hitter into the middle of the three righties to compensate for the strikeouts. Hopefully I’m wrong. Squeezing Didi in at cleanup means you still have that Ortiz/Manny thing with Judge and Stanton, but also split up the lefties. Bird is the x-factor to me. If he stays healthy and produces early, he’ll find himself higher in the order. My preferred lineup is basically the same lineup as above, only with Sanchez and Didi flipped. I’m not going to sweat batting the three big righty bats in a row. Stack the best hitters together and let ’em eat. Ultimately, the Yankees have so many good hitters that the order won’t matter that much. As long as Boone doesn’t do anything crazy like bat Judge eighth or Ronald Torreyes leadoff, the Yankees will be fine. The lineup will evolve as the season progresses and, before you know it, the Yankees will settle into a lineup that just works. Happy Sunday once again, all; I hope you’re doing well as we inch closer and closer to the start of Spring Training. The weather’s not quite as cold as the last time I did one of these, but here’s another mailbag to keep you warm. 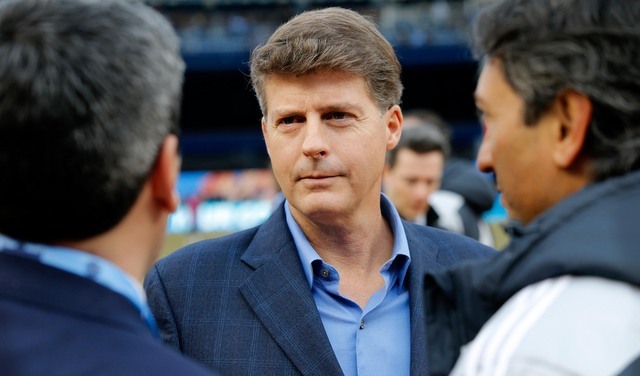 Additionally, if you haven’t already, go listen to the most recent episode of the RAB podcast, which features a great conversation between Joe and ESPN’s Keith Law about the Yankee’s farm system and top prospects. Onto your questions. 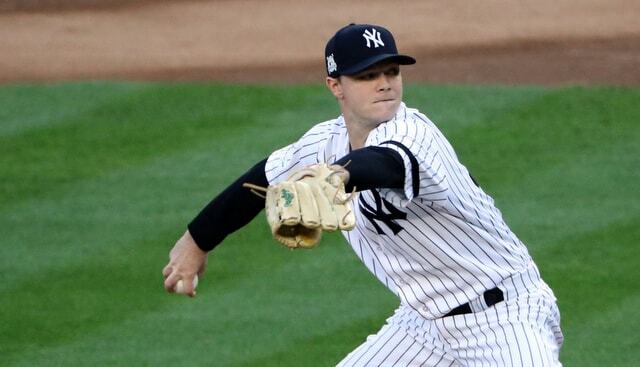 Nick asks: I know Sonny Gray wasn’t the ace some Yankee fans wanted after his acquisition, but he also wasn’t nearly as bad as some would lead you to believe. What are your realistic expectations for a guy who’s all of a sudden (I believe incorrectly) being viewed by some as a back end arm. I touched on Sonny Gray last week and my thoughts are definitely similar to Nick’s. Did you realize that with the Yankees last year, in his 65.1 regular season innings, Gray had a 122 ERA+? In fact, the only season in which he’s failed to record and ERA+ lower than 120 was 2016 (72) when he was injured (only 22 starts). Sonny Gray is a really good pitcher. He suffered a rash of home runs last year (and who didn’t? ), especially when he moved to the Bronx, so as long as he brings that down, I think he’ll be more than fine. ZiPS projects a 3.80/3.83 ERA/FIP split for Gray, good for an 86 ERA- and an 85 FIP-, both of which would be great (remember, minus stats mean lower than 100 = better than average) for the team’s third starter. I’m more optimistic, though, and think he can do a little better than that, with maybe an 80 ERA-. Clay (a former baseball + softball teammate) asks: Do you think the Yankees will strike out too often to win a playoffs series? Nope. Strikeouts are frustrating, but fans may overblow them at times and commentators certainly do. The Yankees ranked towards the back of the AL pack in strikeouts last year–10th out of 15–; it may seem like the Yankees strike out a lot, but, relative the competition, they definitely don’t. They return mostly the same team this year, too. Giancarlo Stanton strikes out at a high rate, but he’s dropped it recently and he, like the other Yankee hitters with high strikeout totals, brings lots of walks and power to mitigate the strikeouts. We should also note that the Yankees won a playoff series and took another to the seventh game against Cleveland and Houston, both high strikeout pitching staffs. Sherri asks: What will be the Opening Day lineup? If the lineup doesn’t spit out exactly that way, I’m at least sure it’ll have that collection of players. Ben asks: If you had to pick one Yankee player to babysit your son, who would you choose? For those of you who don’t know, I have an 18 month old son. He’s awesome. Anyway, the cool thing about this question is that there almost isn’t a wrong answer. A lot of guys on the team are dads, all the way from CC and David Robertson to the younger guys like Gary Sanchez, Luis Severino, and Miguel Andujar. Selfishly, I dream of my son being a left handed pitcher. So, with that in mind, and the fact that he has more dad experience than everyone else, I’m going with CC. Maybe some of the lefty magic wears off on my little guy. Plus, he might make an appearance on R2C2, and that would be pretty dope. Matt, a Mets fan, asks: Will the Yankees ever stink to the point where they’ll be as bad as the Mets? Perhaps quietly, the Yankees fielded one of the best defensive outfields in baseball last season. Brett Gardner has always been very good in left field, Aaron Hicks and Jacoby Ellsbury are strong defenders in center, and Aaron Judge showed the world he is much more than a one-dimensional slugger. Judge is an asset in right field. We only have one season’s worth of data for Judge, but for Stanton, the good defensive performance is not a one-year blip. Only once in his eight seasons has he rated as below-average defensively, and that was 2013 (-6 DRS), the year he battled a nagging hamstring injury. In his other seven seasons, Stanton never finished below +3 DRS. He has six seasons of +6 DRS or better. He’s a good defender. I promise. Adding another top defensive outfielder to an already very good defensive outfield is, generally speaking, pretty awesome. Now the Yankees have to figure out how to deploy these guys. Not counting Clint Frazier, they have five outfielders (Ellsbury, Gardner, Hicks, Judge, Stanton) for three outfield spots, and both Judge and Stanton are career right fielders. Stanton played one emergency inning in center field back in 2011. Otherwise neither he nor Judge has played a position other than right field in the big leagues. Stanton said he is willing to play wherever the Yankees need him to play — “I’m fine with (left field). I can bounce around. Wherever they need me, I’m okay with that. I always liked DHing when we played the AL teams in previous years,” he said at his press conference — and Judge has since said the same thing, unsurprisingly. That’s good. If one guy came out and said he’s only comfortable in right field, it would’ve created some headaches. There are a few things to keep in mind about the outfield situation. One, the Yankees have a strikeout/ground ball pitching staff, meaning they could maybe get away with a suboptimal outfield alignment. (They allowed the third fewest fly balls to the outfield in the AL last year.) Two, right field at Yankee Stadium is tiny. There’s not much ground to cover out there. And three, left field at Yankee Stadium is pretty spacious, especially in the left-center field gap. Ideally you’d want the better defender in left. Let’s talk about this some more. 1. Here are at the numbers. Judge was a very good defensive right fielder last season and Stanton has been a very good defensive right fielder for pretty much his entire big league career. We know that much. Let’s dig a little deeper and look at some numbers beyond DRS, shall we? We shall. There is so much more to range than pure speed. You need to get a good jump and take a good route as well. But, speed helps make up for poor jumps and/or routes, and there are times an outfielder has to simply get on his horse and run a ball down. According to Statcast’s sprint speed, Judge and Stanton are equally fast at their fastest, if that makes sense. We don’t know who reaches their top speed quicker — that is kinda important! — because Statcast doesn’t provide that information. All we know is both guys are equally fast once they get going. As for their arms, Judge did a much better job preventing runners from taking the extra base (first-to-third on a single, etc.) last season — the league average right field hold rate was 47.7% in 2017 — though the ballpark plays into that. Right field at Yankee Stadium is tiny, allowing Judge to play in a few more steps, and thus giving him a better chance to hold the runner because he was that much closer to the infield. Stanton didn’t have that luxury in spacious Marlins Park. We know Judge has a strong arm anyway. We saw it all year. Stanton has a strong arm too.
? The eye test tells us both Stanton and Judge have strong right field caliber arms — it seems Stanton has to put a little more effort into his throws than Judge to get similar carry, but at the end of the day, a good throw is a good throw — and Statcast tells us they are equally fast once underway. That information doesn’t help us determine who would be the better right field option going forward! Catch probability might, however. According to the ol’ Statcast machine, Judge made considerably more difficult plays than Stanton last season. By difficult plays, I mean outs recorded on batted balls that went for base hits more than 50% of the time based on their exit velocity and launch angle. If the hit probability is 75%, the catch probability is 25%. And on plays with a catch probability no greater than 50%, Judge made the play 43.7% of the time. Stanton? Only 23.0%. Huge difference. Yuuuge. Okay, so what does that mean, exactly? All it tells us is Judge made more (way more) difficult plays than Stanton last season. Will he make more difficult plays going forward? Who knows! This is the tricky part. We know what each player has done defensively in the past. The Yankees are concerned about their defensive performance going forward. Who has the tools to be the better defender in the future? They both have prototypical right field tools. Judge made more tough plays last year, and maybe that means he will continue doing so in the future, which in theory means he’d be better suited for the more spacious left field at Yankee Stadium. 2. Judge has moved around more recently. Judge has played right field exclusively as a big leaguer, but he hasn’t been a big leaguer very long. He was in Triple-A as recently as August 2016. And during his Triple-A stint in 2016, Judge played seven games in left field as well as three in center field. It’s not much, but it is something. Aside from that one emergency center field inning that means nothing, Stanton has been a full-time right fielder for a decade now. Personally, I don’t think those seven games in left field two years ago means a whole lot. Or at least they won’t mean much during the decision-making process. Maybe Judge is ever so slightly more comfortable playing left than Stanton, but I can’t imagine seven games two years ago means much. It is a piece of information the Yankees could consider, however. 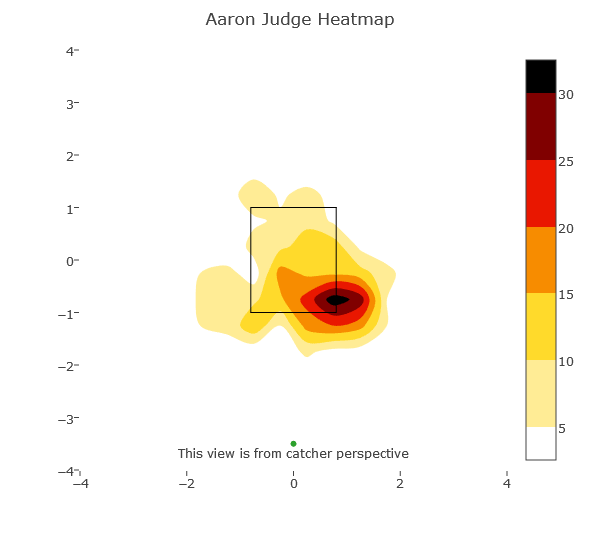 Maybe Judge showing he’s capable of moving around makes them more likely to put him in left going forward. Who knows? “Obviously, right now Giancarlo is a guy that’s been comfortable in right,” Mattingly said. “Marcell is a guy that’s showed he can play left, center or right. We are digging into the metrics of Giancarlo and Marcell. Ultimately, the Marlins did not move Stanton to left. He stayed in right and Ozuna stayed in left. Why? I’m not sure. I don’t know if Stanton said he wanted to say in right, if Ozuna said he wanted to stay in left, or if the club determined Stanton in right and Ozuna in left was their best defensive alignment. It’s probably the last one. I don’t think Stanton or Ozuna made a stink about possibly changing positions. 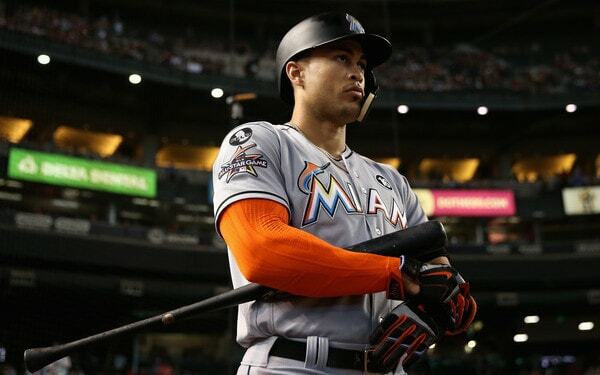 Should we read anything into the Marlins considering Stanton in left field, then deciding it was not the right move? They have a very small analytics department — Tim Healey says their analytics department didn’t even exist until two years ago, if you can believe that — and they haven’t been the most well-run organization in the game. Maybe we should just ignore their conclusion entirely? The Yankees have a state of the art analytics department and huge scouting department. I’d trust the Yankees over the Marlins every day of the week, though I did think it was interesting and noteworthy that Miami did think about moving Stanton to left last year. 4. Don’t forget about the DH spot. One reason the Yankees were comfortable acquiring Stanton and his massive contract is the DH spot. They know once he gets into his 30s and inevitably begins to slow down, they can move him to DH. Tying down the DH spot with an expensive older player a la Alex Rodriguez isn’t ideal, but it exists as an option. The Dodgers, Stanton’s first choice, couldn’t offer him a chance to DH. In reality, the Yankees will rotate five outfielders between the three outfield spots and the DH spot, not rotate five players between the three outfield spots only. Stanton and Judge are going to play everyday, Hicks and Gardner will play most days, and Ellsbury will play a few days. That seems like the plan until further notice. 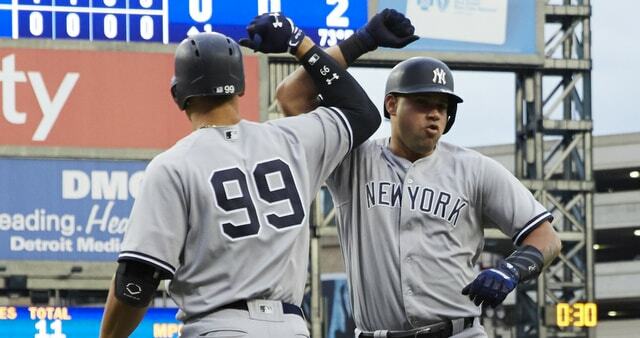 The Yankees will use the DH spot to give Stanton and Judge, two very large humans, regular days to rest and take it easy on their legs. They want to preserve them for the long haul. Both crushed it in their limited at DH. I’m glad neither guy has crummy numbers at DH because if one of them did, you know we’d be hearing “he hasn’t been good at DH so he should play the field full-time” arguments. No. Just no. Both Stanton and Judge should get regular turns at DH in an effort to preserve their bodies long-term. These are big, big dudes. Running around the outfield day after day, year after year will do a number on their knees. So, thanks to the DH spot, neither Stanton nor Judge has to play left field regularly. They’ll just have to play it once in a while, specifically whenever Gardner gets a day off or the Yankees are in an NL park for an interleague game. That’s the ideal scenario. Everyone stays healthy, Gardner sees the most action in left field, and Judge and Stanton split their time a right field and DH. Hopefully the Yankees don’t have to move Judge or Stanton to left on a full-time basis at any point this year. That will mean something’s gone wrong. Based on everything we just talked about, it seems like Judge is better suited to slide over to left field than Stanton, though the evidence is hardly overwhelming. Judge played some left field as recently as 2016, and his big advantage in making difficult plays (per Statcast) suggests he is better suited to play the larger left field at Yankee Stadium. The argument is not convincing, and in a way that’s a good thing. The Yankees are picking between two good options, not two bad options. At the end of the day, this is going to be decided in Spring Training. All those words up there? Meaningless. The Yankees figure to give both Judge and Stanton left field time during Grapefruit League play, and whoever looks more comfortable out there will probably slide over. The players will decide this for the Yankees. If both look comfortable, great! It’s a good problem to have. Let’s see what they both look like in left field first. We’re not going to know the Yankees’ best possible outfield alignment until we see Stanton and Judge go out and actually play left field in games. These things have a way of taking care of themselves. Ideally neither guy would spend much time in left field during the season because they’re splitting time at right field and DH while Gardner runs down everything in left field. That seems like the best outfield alignment. Gardner in left, Hicks or Ellsbury in center, and either Judge or Stanton or right. If one has to move to left full-time, so be it. The Yankees will adjust.